European defence pillar represents one of the most controversial EU integration process. Since the Treaty of Dunkirk in 1947, West European governments have been concerned about that issue. However, the nature of the defence policies, known as “high policies”, and the reluctance of states on giving up their sovereignty in such areas, have hindered the process (for istance the European Defence Community failure in 1954). Finally, in the 1990s the idea of a European security and defence integration slightly advanced (1). After the Yugoslav crisis, the project for a more effective European Defence Policy rapidly developed. It conquered progressively an increasing role in Member States agendas. The enthusiasm followed the Saint-Malo declaration in 1998 allowed the success of the European Security and Defence Policy. The ESDP/CSDP represent the first EU intervention tool in international crisis-management. This project belongs to the Post- Cold War era “forward defence” architecture based on expeditionary crisis- management operations (2). In 2003 the first EU military mission was launched, the EUFOR Concordia, and in the next years the EU flag has flown in several operation’s theaters abroad. Consequently, the EU would be theoretically equipped with an intervention tool which enhances the EU capabilities in being effective on crisis management (3). Nevertheless, despite the Lisbon Treaty reform, the CSDP is still characterized by firstly, a complex decision-making process marked by the consensus rule and secondly by non-binding procedures for the states. Both two aim to preserve the Member States autonomy (4). Furthermore, the absence of formal compelling procedures and the persistence of intra-states divergences have led to launching small-scale operations in geographically limited areas, lacking in ambitions and strategically irrelevant (5), with few exceptions, such as for the EUFOR RD Congo in 2006. Also, two phenomena appeared in the last years. First, the reduction of military budged because of the 2008/2009 economic crisis, which has gradually mitigated the enthusiasm for military expedition operations. Then, since the resurgence of the Russian military activities in the East, Europeans are gradually more concerned about territorial defence, refocusing on national defence capabilities instead of projected actions (6). This trend has led to a renationalization of defence policies, also highlighting the inadequacy of the CSDP in certain theaters of operation, principally the East Europe. Which CSDP for the future? 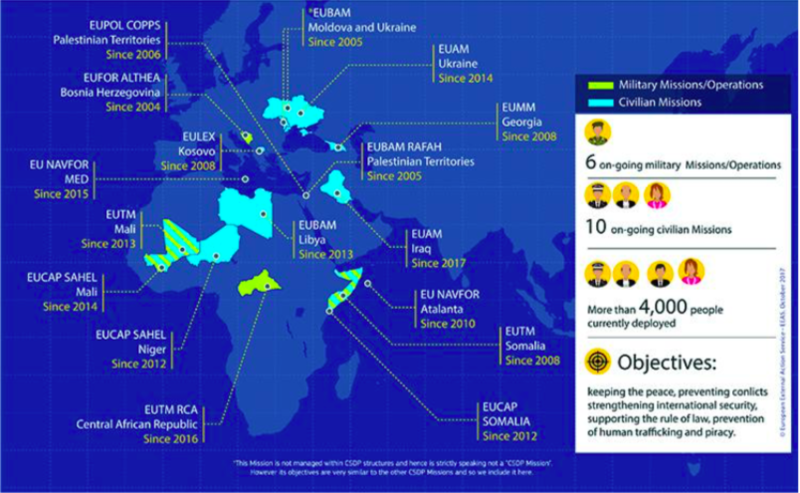 Overall, of the 16 EU missions around the world, half of them are deployed in Africa (7), also representing the major part of the EU efforts and investments. However, compared to the past, the total number of missions deployed has remained steady. Moreover, under a qualitative perspective, the level of ambition never increased, thus the recent engagements in Mali, Niger, Libya and RCA count a limited number of civilian and military staff (8). Focusing on the ongoing CSDP operations, presently two trends are definitely emerging: firstly, the EU commitments in Africa; secondly the need of other actor’s support. 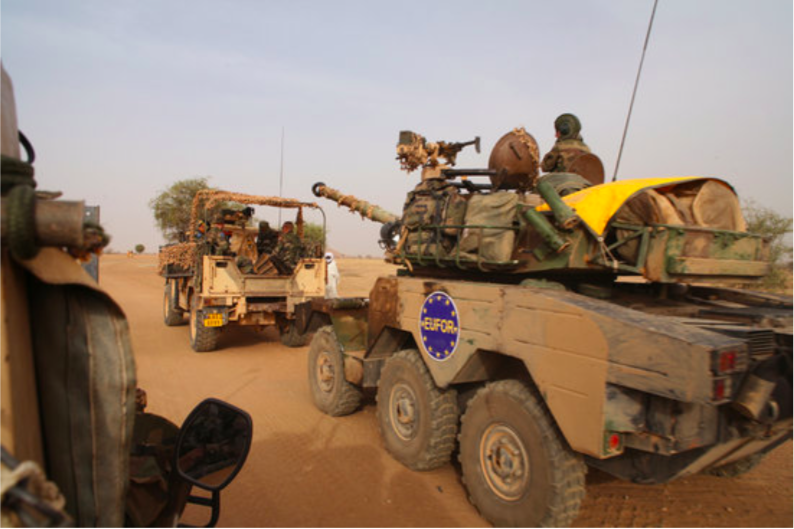 In this sense, it is noteworthy of an even more frequently overlapping of national missions, such as the French Barkhane in Sahel region or the Italian MISIN in Niger, and other EU missions. Meanwhile, the EU remains a NATO partner in the Horn of Africa whereas cooperation with the UN in other African regions has never ended. Therefore, despite the launch of the Global Strategy document in 2016 for “strategic autonomy”, it seems to remain an unrealistic goal. After 20 years, not only have the CSDP hurdles never been completely solved, but also member states have not requested for an EU action or presence in Libya (2011), or in Crimea (2014) (9), thus preferring to cooperate within the NATO framework, finally admitting the CSDP limits (10). So, which CSDP for the future? CSDP remains “a small part of a much bigger game”(11). However, living in the time of “existential crisis”(12), Europeans should try to cooperate on playing an effective role in the international arena. 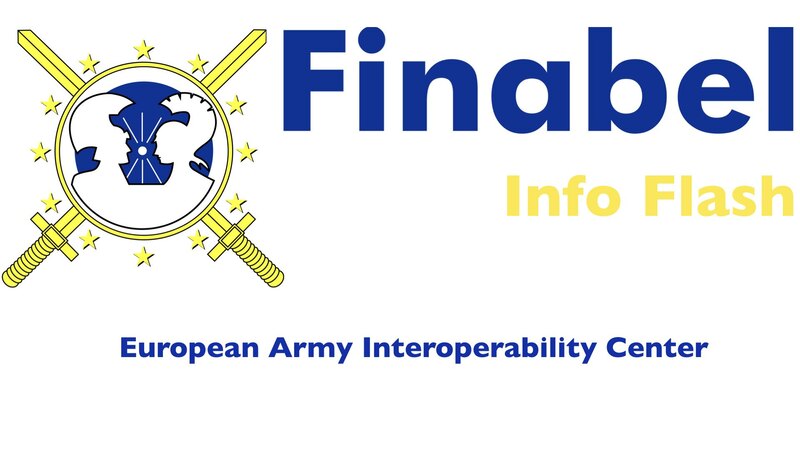 The first step could be modifying the crisis-management decision-making, particularly the consensus rule and then strengthening intergovernmental collaboration, in primis the PESCO cooperation. Nevertheless, the forthcoming EU elections (and the new EU Commission equilibria), the Brexit related matters and the new international challenges pose a number of questions concerning the future assets, the EU’s role in the world and how it could intervene internationally. Written by Lorenzo Giuglietti on behalf of the Finabel Permanent Secretariat. • (2011) C. J. Bickerton, B. Irondelle, A Menon, “Security Co-operation beyond the Nation-State: The EU’s Common Security and Defence Policy”, Journal of Common Market Studies, Vol. 49, No. 1, pp. 1-21. • (2010) T. Dyson, “Neoclassical realism and defence reform in post-cold war Europe”, New York, Palgrave Macmillan, 2010. • EEAS website, (https://eeas.europa.eu/headquarters/headquarters- homepage/area/geo_en ). • (2016) EU Global Strategy A Global Strategy for the European Union’s Foreign And Security Policy, (https://eeas.europa.eu/sites/eeas/files/eugs_review_web_0.pdf ). • (2014) J. Howorth, “Security and Defence Policy in the European Union” (2nd ed. ), New York, Palgrave Macmillan, 2014. • (2015) ISSEU, Chaillot paper n°134 (https://www.iss.europa.eu/content/csdp- action-%E2%80%93-what-contribution-international-security ). • (2016) D. Keohane, “The renationalisation of European Defence Cooperation”, in O. Thränert and M. Zapfe (eds), “Strategic Trends 2016: Key Developments in Global Affairs”, Zurich, Centre for Security Studies, 2016, pp. 9-28. • (2018) U. Meijer, M. Wyss, “The Handbook of European Defence Policies and Armed Forces”, Oxford, Oxford University Press, 2018. • (2009) A. Menon, “Empowering Paradise? ESDP at Ten”, International Affairs, Vol. 85, No. 2, pp. 227–246. • (2012) A. Menon, “Defence Policy”, in E. Jones, A. Menon and S. Weatherill (eds), “The Oxford Handbook of the European Union”, Oxford: Oxford University Press, 2012, pp. 585-599.